Amid revealing details of its highly anticipated digital video platform Disney+, Walt Disney says it is considering bundling its three big streaming services -- Disney+, ESPN+ and Hulu -- in a low-priced package to consumers. Speaking at Walt Disney’s Investor Day on Thursday, Kevin Mayer, chairman of direct-to-consumer and international, said the company will "likely bundle at a discounted price." Mayer added Disney+ is set to launch as an ad-free service to U.S. consumers, November 12, at a low price of $6.99/month or $69.99 for year. This would be less than many other ad-free digital video platforms. “We believe this is an extremely compelling value proposition for consumers,” he says. For its new Disney+ service, company executives say every division of its major brands will be contributing to the new streaming platform with exclusive content. In the first year of operation, it will have more the 25 or more new exclusive TV series on the site and 10 or more exclusive movies. By year five, it will have 50 or more original new TV series. Though the consumer interface will look similar to Netflix, Hulu, or other digital video series, Disney+ will be slightly different, including areas for specific Disney brands, such as Pixar, "Star Wars," Marvel, and National Geographic. When a user hovers over a brand title, an animated image is set off — fireworks blasting behind the Magic Kingdom for the Disney title or a comic-book flip for Marvel. In somewhat of a different tack versus other digital platforms, subscribers can download all Disney+ content for offline access. Disney users can select personalized avatars using characters from Disney’s films and content, such as Buzz Lightyear. At launch, Disney+ will have on its platform the recent Marvel Studios theatrical film hit “Captain Marvel,” as well as many other recent titles, including films from the “Iron Man” franchise. Marvel will be starting a new TV series, as well as its first animated series. Disney+ will see almost 20 Pixar movies available on the first day of its operation, as well as number of Pixar theatrical shorts. Disney+ will also have major classic animated features from its library: "Bambi," "The Jungle Book," "Snow White and the Seven Dwarfs" and "Aladdin.” It will be the exclusive home of "Frozen II" next summer. “Star Wars” films make an appearance as well at launch -- including recent movies and “Rogue One.” Disney+ will also have a new “Star Wars” TV series “The Mandalorian” at the start of Disney+. 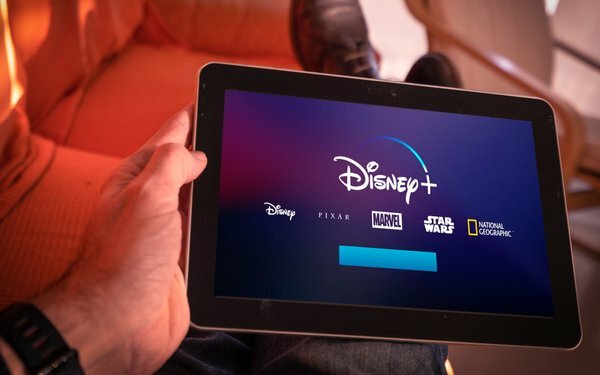 A massive marketing campaign will be launched for Disney+, using all its brands, as well as its theme parks, hitting 95% of its target audience, reaching 100 million U.S. homes. Concerning its other direct-to-consumer businesses, Mayer says Disney says is looking to expand ESPN+ to Latin America and Hulu to international markets. ESPN+, launched in April 2018, has limited advertising on its platform, with a $4.99 a month price tag. It has 2 million subscribers. Hulu has two on-demand services -- limited advertising ($5.99/month), and ad-free ($11.99/month). Hulu now has a collective 25 million subscribers for all its on-demand services. Reports says Hulu with Live TV service priced at $44.99 monthly is at 2 million subscribers. Hulu, which started up in 2008, is now 60% owned by Disney, via its acquisition of Fox’s business -- with 30% owned by Comcast Corp. and WarnerMedia, 10%.